I’ve had a few requests to review this new Rock Lee Anime, and with the first episode out today I thought I might as well give it a try and at least see what it’s like. So, aside from very long episode titles, what else is there to expect from Rock Lee and His Ninja Pals? Well as you probably guessed, it is very silly. All the characters are in chibi form, and it is very light hearted from start to finish as expected. It lasts 23 minutes, but is split in to two different stories. 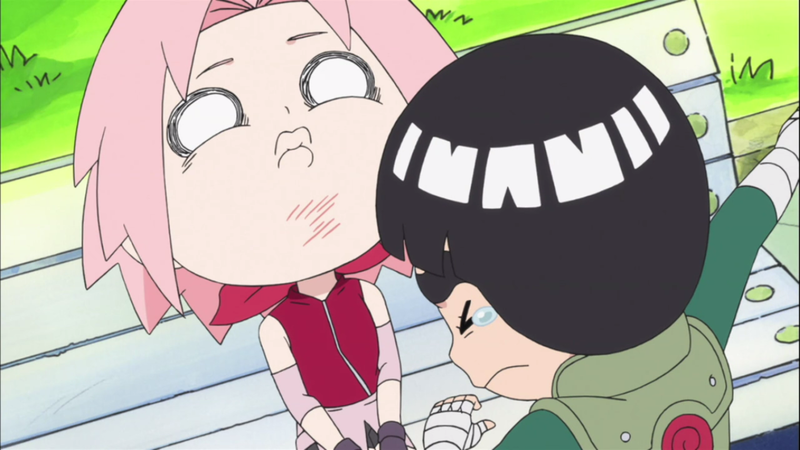 The first one was about Rock Lee helping someone who was getting hassle from some loan sharks, while the second half was about Rock Lee and Naruto having a competition to try and get the last voucher for a special delicacy food for an old woman who requested it as part of a mission. I definitely enjoyed the second story more, as adding a more recognisable figure like Naruto rather than some generic one-off character made it more fun, at least early on anyway. Now don’t get me wrong, I definitely don’t want the whole show focused around someone like Naruto or Sasuke, that’s what the main show is for, but if used every now and then it will probably work better. It also didn’t help the first episode that most of the jokes / humour were based around Rock Lee either standing in (or just narrowly avoiding standing in) some golden poo. Yes, you read that right, golden poo. Maybe the first time you could have a little chuckle or raised a smile, but it was very overused to the point you’re just wondering why it keeps happening. There were a couple of funny moments, but it was far too repetitive. The second half was a definite improvement as I said. The addition of Naruto really helped, as then Lee had someone else acting silly to bounce off of instead of just being silly and crazy by himself. The two standout moments being the way Rock Lee was supposedly training, while he was just literally wrapping his whole body round a stump and spinning around (I can’t explain it well, but think Orochimaru slivering and coiling about in his snake form and you get the picture). 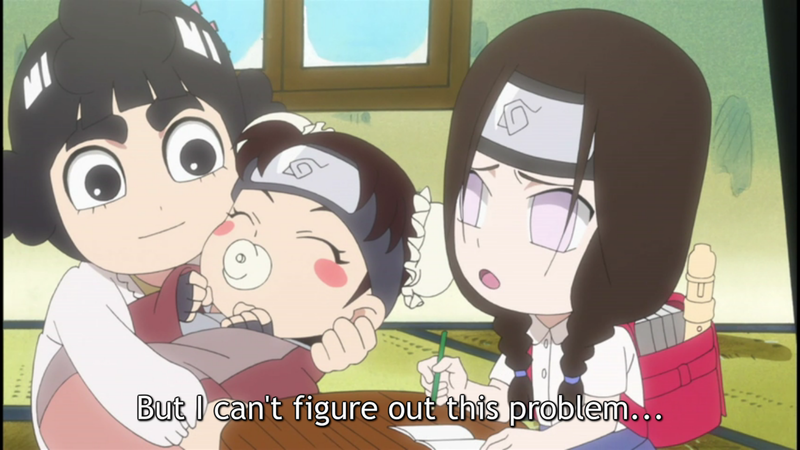 The other being the little skit with Rock Lee acting as the mother of Neji – who is a girl in it and his daughter – and TenTen, who is Rock Lee’s baby daughter (as you can see in the pic at the top). Of course it didn’t make any sense, but it was genuinely funny and stood out as the best moment in the 23 minute show. One other thing I want to mention is, despite this supposedly being about Rock Lee becoming the star, in actual fact I found both Neji and TenTen to be far better and more amusing. 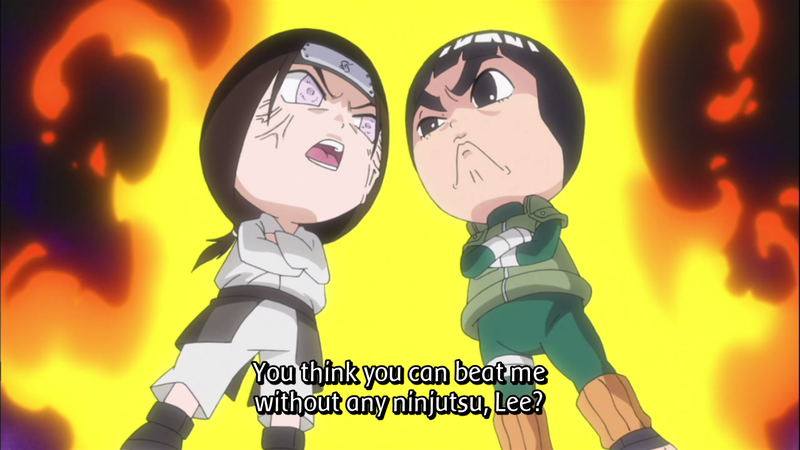 Neji especially was funny with his reactions to Rock Lee’s antics, and I am definitely hoping this continues as the series progresses. Overall I have mixed views over the show so far. At times it falls flat, while later in the same episode you can get a laugh or two (usually from Neji or TenTen as I said). I don’t really know how it will turn out in the end, as this type of show doesn’t really lend itself to being stretched out over a lot of episodes or as full episodes for that matter, though fortunately they did have the sense to split the 23 minutes in to two seperate episodes (if you will). I will definitely be giving the show another chance next week before I can make a fair and honest judgement of it, but I do hope it steps up its’ game a bit. If you’re unsure whether to watch this or not, I say you might as well give it a try as it’s not offensively bad or anything, and it does seem like a fun way to spend 23 minutes even if only for Neji and TenTen.